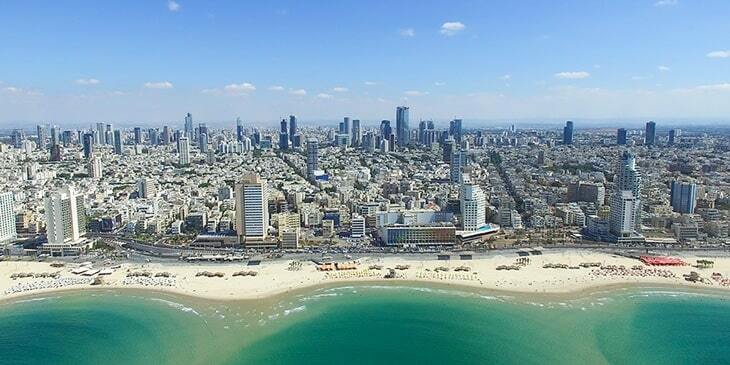 Tel Aviv is renowned as the White City of Israel which boasts sandy beaches, impressive art galleries, ancient heritage monuments, chic boutiques, Ottoman-era streets and captivating museums. This city has really evolved over the past few years, offering a diverse range of tourist experiences. Tel Aviv is also Israel’s cultural capital, boasting a wide range of art galleries. The Joseph Bau House is amongst the city’s best galleries, highlighting the life story of famous Polish-Israeli artist Joseph Bau; here you can browse his animated movies, oil paintings, holocaust paintings, drawings and caricatures. Step inside one of the most prominent galleries in Tel Aviv, the Chelouche Gallery and discover a collection of sculptures and paintings created by established Israeli artists, as well as work from UK artist Melanie Manchot and South African artist William Kentridge. Other must-see galleries in Tel Aviv include the Sommer Contemporary Art gallery and Bauhaus Center Tel Aviv. You can book Tel Aviv flights from India through Brightsun Travel. Tel Aviv boasts some of Israel’s most excellent museums. Step inside the country’s largest museum, the Tel Aviv Museum of Art to admire a rare collection of ancient and modern Israeli prints, paintings, drawings, photographs and sculptures. Here you can browse thousands of artworks created by national and international artists including Spanish painter Pablo Picasso, Dutch painter Vincent van Gogh and French painters Paul Gauguin and Claude Monet. Visit the Eretz Israel Museum and witness several historical artifacts discovered in Tel Aviv, including coins, fabrics, ceramics and glasswork. For a unique museum experience, head to the Cartoon Museum in Holon which showcases various cartoons depicting an insight into the country’s history and culture. Then there’s the Independence Hall Museum where you can learn about Israel’s Declaration of Independence through audio-visual presentations. Finally, make sure you visit the Rubin Museum to explore lots of oil paintings and sculptures, created by famous Israeli artist Reuven Rubin. Book cheap tickets to Tel Aviv and look forward to discovering this paradise of rich cultural heritage.